Hey my gorgeous preeners, hope your Friday is good!!! 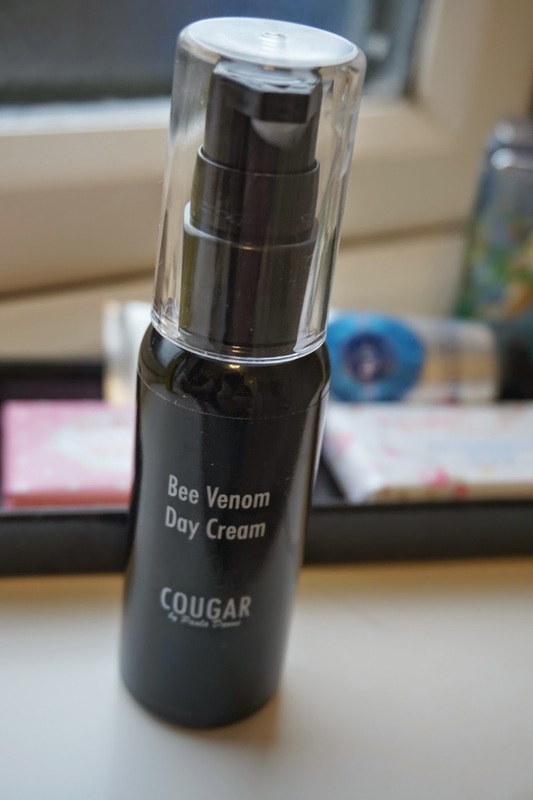 When Cougar Beauty Products recently got in touch asking me to try out their Bee Venom Day Cream, I was more than intrigued to say the least. 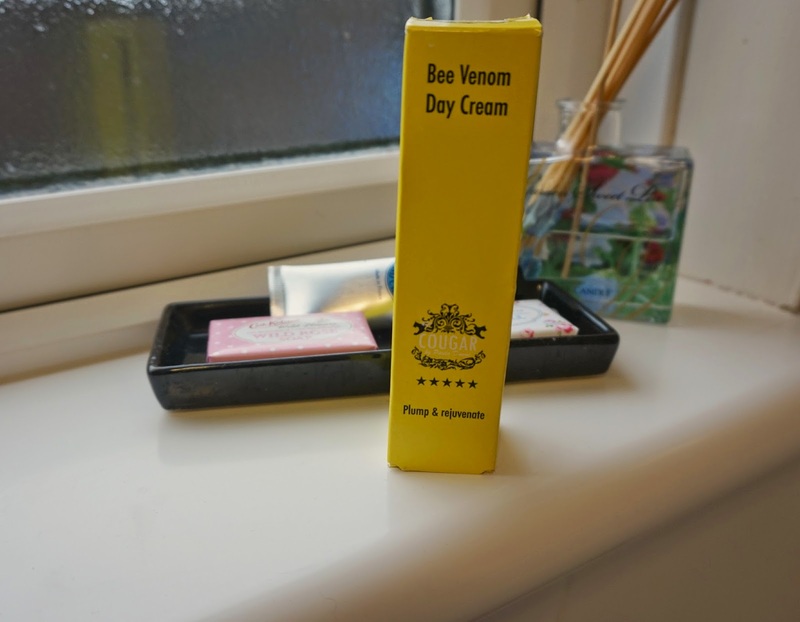 Bee Venom products are very popular at the moment, and for the past year or so I have seen numerous reports and reviews of how it can greatly help the appearance of fine lines and wrinkles due to its plumping effects. I don’t have a lot of wrinkles but I am all for a pre-emptive attack on them pesky lines to keep them at bay. When I looked into the Bee Venom phenomenon the thing that really stood out to me was that the venom mimics the effect of a sting and aims to send blood and increased circulation to the skin and in turn helping the lines and wrinkles. Did anyone else wince when I said bee sting and face in the same sentence? Bee venom is said to encourage natural cell regeneration and anything that helps regeneration gets me thinking! I thought why not give it a try as it was a brand and product I hadn’t tried before and I love supporting and trying new things. 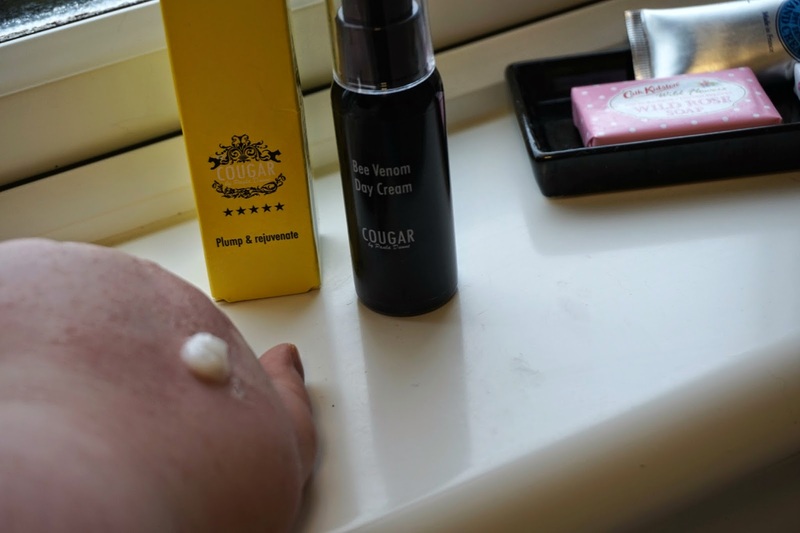 I was sent a gorgeous yellow box with a sleek black bottle with a little pump to dispense the product, kudos to cougar beauty for this as we all know that having a pump makes it so much easier to distribute the product and also it makes it more hygienic. I cleansed as normal and then as directed I used the day cream just like my normal moisturiser, it does recommend using a hot cloth directly before application as it opens the pores and lets the cream sink nicely in so your face gets maximum effect. I used one full and a little half pump and this was more than enough for my face. It has a very gentle scent which I loved as I am not that keen on scented products. It is lovely and lightweight and I felt my oily combination skin thanked me for that, my face and thick heavy products do not get on. I have been using this as my day time moisturiser for just under 3 weeks now and although I wouldn’t say it hasn’t made a great difference in the moisture of my skin but what I have greatly noticed is that the bumpiness and redness on my forehead has reduced. My skin without a doubt feels plumper and smoother. I have not had to use a primer under my foundation as this just makes my foundation stick all day, which is always a bonus in my eyes to not have to put more products on than necessary. Cougar Beauty also have a range of other items including, volcanic ash, snake and snail skincare. They also do a range of tanning products, cosmetics, bodycare and hair extensions. Without a doubt it is a store I will be looking closer at as I have my eye on a few of their products. Overall I would say definitely give this product a try or if you don’t feel the venom is for you, there is plenty of other fab ranges which you could try. Thanks to Cougar Beauty for asking me to review this item. Nice review. I tried Rodia's Bee Venom line a while back and I also really liked it. Love the name of this one the best! Great review - may need to try it myself! Thank you so much for your follow on bloglovin - I have followed back and cant wait to see more! There are additionally incredible common mixes like Kerry Washington Skin Cream CynergyTk that a couple of creams use and can animate the creation of collagen and elastin in your skin. This specific fixing helps in devastating have a peek at this website the microbes that causes skin break out This oil is known for its supernatural mitigating and recuperating properties.